Anheuser-Busch has signed a multi-year partnership agreement with the Convoy freight matching network for the company’s shipping operations, a move analysts say give it a let up in the race to see who will win in the "Uber for Trucking" space. Anheuser-Busch selected Convoy to be one of its partners to improve flexible-trucking capacity, new approaches to pricing, and visibility-driven service improvements. In the first phase of its partnership, Convoy will serve as a trucking service provider for Anheuser-Busch shipments. Convoy operates a network that matches freight and available capacity for shippers and carriers. It's been around since 2015, and it raised $62 million in funding last summer. The company says its connected service represents more than 10,000 trucking companies. Convoy also provides resources and tools for shippers and carriers, including real-time freight tracking, transparent pricing, and automated payment processing. 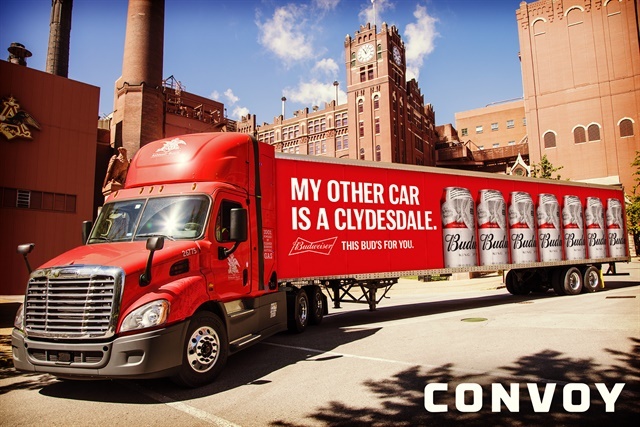 Anheuser-Busch has used Convoy in the past to transport its products, but the two companies will now share more in-depth data regarding logistics, according to a report in Forbes. The hope is that by sharing data more, the two companies will be able to streamline operations and reduce wasted capacity.